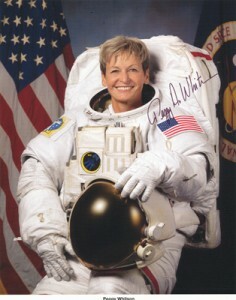 Born on Febrwuary 9, 1960, Peggy Whitson grew up on the family farm near Beaconsfield, Iowa. She graduated from Mount Ayr High School, received a Bachelor of Science degree from Iowa Wesleyan College and a Doctorate in biochemistry from Rice University. Dr. Whitson was accepted for astronaut training in 1996 becoming Iowa’s first female astronaut. Her first space mission was in 2002 aboard the International Space Station as a member of Expedition 5. During her second mission in 2007, she was the first female commander of the ISS, Expedition 16. She has logged more time in space than any other woman in the world with 377 days. Dr. Whitson has performed a total of six space walks, adding up to 39 hours, 46 minutes, also more than any other woman. She presently serves as Chief of the Astronaut Corps, responsible for the mission preparation activities of all Space Shuttle and International Space Station crews and their support personnel. She is the first woman to serve in the position. Dr. Whitson lives in Houston, Texas.